The 500830 signal generator and 500831 signal analyser are portable tools, generating or analysing SD/HD/3G SDI and HDMI 2.0 video test patterns up to a resolution of 4K at 60Hz. An internal, rechargeable, Lithium-ion battery supports up to five hours of use after charging. By using both generator and analyser together, an engineer can test the integrity of a HDMI cable. Up to HDMI 2.0 is supported , with a video bandwidth of up to 18GHz, 6GHz per channel. 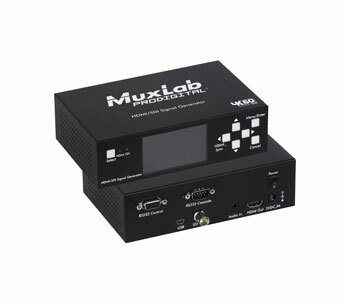 HDCP (High-bandwidth Digital Content Protection) 2.2 or 1.4 is also supported along with SD-SDI, HD-SDI and 3G-SDI serial digital interface versions. This is programmable test device, used as the first in a chain of equipment, to generate test patterns and display the output signal onto a monitor or similar output device. The generator has 54 sets of embedded timing including 4K(30), 4K(25), 4K(24), HDMI2.0 4K(50), HDMI2.0 4K(60), 720P-3D and 1080P-3D fixed timing modes and one AUTO mode. Ten sets of user definable timings can also be programmed. The 500830 can produce thirty-three 2D test patterns and one 3D test pattern. The front panel has a 3-inch LCD display to show the menu listings, setting parameters or actual signal generated. An HDMI/SDI mode select button, an HDMI active LED and an SDI active LED are situated to the left of the screen, whilst navigation buttons along with 'Enter' and 'Cancel' buttons can be found to the right. A HDMI sync LED illuminates constantly to indicate the HDMI link is active and illuminates intermittently if an EDID (Extended Display Identification Data) error is detected. The rear panel houses two 9-pin D-sub connectors, one for RS232 control and one for RS232 cascading - required when using more than one signal generator. SDI and HDMI outputs can be linked to the equipment under test, whilst an unbalanced, 3.5mm jack socket can be used to input 2-channel audio for use as an alternative to the integrated sine wave generator. A USB socket allows the connection of a Windows PC using the supplied 1.2m USB cable. The rear panel also houses a power switch. Included accessories: 5V, 1A power supply, 2x wall mounting brackets, 1.2m USB cable, 4x stick on rubber feet. This is used as the last item in a chain of equipment, to analyse the test patterns provided from the hardware in the chain. The front panel has the same features as the 500830 signal generator, with the LCD panel displaying the received signal as opposed to the generated signal. The rear panel has the same connections as the rear panel of the 500830 signal generator however the SDI and 3.5mm jack sockets are outputs, and the HDMI socket is an input.